Flowers AND candy! Somebody's gonna have an awesome day. Sold individually. Single-serving-sized bags of either Original or Wild Berry Skittles crafted with Tootsie Pop centers to look like flowers. 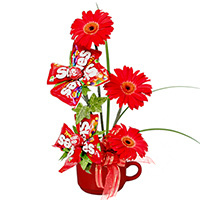 Arranged with fresh gerbera daisies and lily grass in a mug. Bloom and mug colors may vary. Also available in an M&M's version, Chocolate Fix #170610.